India is one of my favourite travel destinations. The reasons why I love India would make a list as long as long as your arm, but the big picture is that when I’m immersed in India I feel a deep sense of connection with the goodness and warmth of humanity. From the moment I stepped outside the modern air conditioned buildings of Delhi airport, I was entranced. India smelt different, it sounded different, it looked different. I felt an intense frisson of excitement. I visited India three times in a short space of time helped by with small tour specialist who also happens to be a friend. She takes special interest tours to India and also makes trouble free safe independent travel arrangements with drivers, guides and unique accommodations, a soft approach I know, but it’s an economical and trouble free way to visit the sub continent. Her contacts open doors to experiences with people across all walks of Indian life, from Rajas to nomadic tribesman, you see the real India, the good, the bad and the ugly. It is not a sanitized view. It’s impossible for me to think about India and not have my thoughts immediately turn to food. The cuisines of India are as diverse as the land itself. In the north the diet incorporates wheat and mutton, in the south coconut and seafood are common, while Gujarat in the west, Ghandi’s birthplace, is vegetarian and tea total. I’ve never seen sweet corn in India, my travels have been in the cooler months, but it’s rich flavour marries well with spice and the sweetness is perfect with chilli. 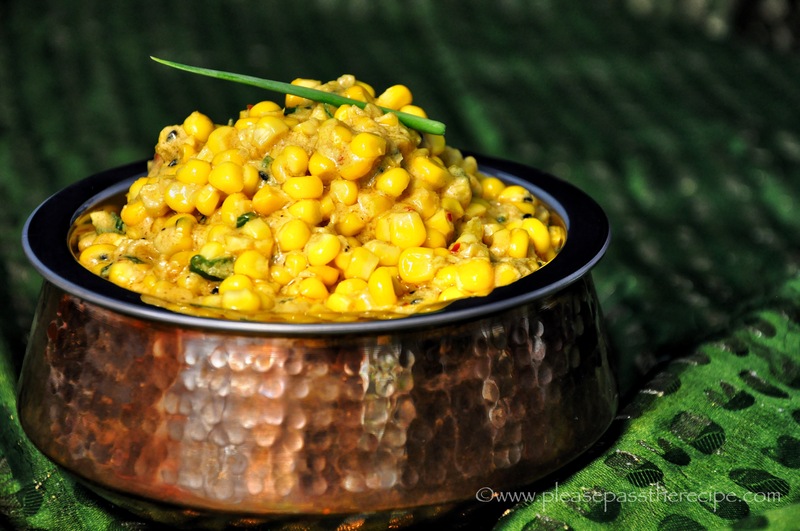 This sweet corn curry is the first recipe in a series I’ll share this month. I am dedicating March to a late autumn produce driven curry feast of quickly prepared dishes. It will be a feast of flavours and posts. Melt the ghee in a heavy based pan, then add the nigella seeds and cook until they sizzle. Add the ginger and swirl it into the ghee, then add the ground spices, coconut milk, chilli and water. Stir well to combine, then add the corn kernels. Bring the pan to the boil and simmer, uncovered for 10 minutes. Add the sliced spring onion greens, then season to taste with sea salt and ground black pepper. Transfer the corn in coconut gravy to a serving bowl. Serves 4-6 with other dishes. Sandra, I love India too. One of my best culinary memories was a paneer butter masala I had in Bangaldore – have tried to replicate it several times but only with moderate success. We have corn galore so might try your recipe. For some reason corn has always landed at the bottom of my vegetable list and I do not think I have ever had it in a curry form. That said, looking at the very interesting recipe and with my love of anything ‘curried’ this recipe is already on the kitchen to-do pile!! March looks like a very interesting month ex Brissie . . . 🙂 ! I hope I can grow that recipe to-do pile this month Eha..
Oh my gosh that sounds like it would be amazing – I love an Indian feast. India is on my bucket list, but it is a very long list and doesn’t in any way align with my bank balance. I will enjoy travelling in my dreams and through your lovely recipes. Thanks for your enthusiastic comment, I hope you enjoy the journey.. This is like an Indian version of creamed corn, what a great idea! I’ve pinned it for corn season, still a few months from now. Thanks Liz. A friend made the same comment, it’s delicious nevertheless. I have never seen sweet corn ‘curry’ before, but this sounds delicious. I’ve also never been to India, but it is on the list. You make it sound very special (and magical as Francesca says). A ‘Slow’ travel method is the best, particularly for people who cannot abide those group tours as they rocket from one tourist place to another without really getting to know something about the culture and the people. Looking forward to more India inspired recipes this month. I love it when inspiration comes from something I read. Hope your dinner was good.. It was lush. I even remember to fish out the cinnamon quills and cardamom pods! I have never thought of using corn in a curry, great idea. I just used up three ears in a Mexican chicken casserole but my next lot is earmarked (deliberate pun) for this. A very fine prelude to a good seasonal curry. India is a magic place. I also loved it there and hope to get back one day. The colours,the energy, the people. Now that corn is hitting the markets i will tey this dish. A friend commented it was like sophisticated creamed corn. I think that’s a compliment! Enjoy…. This entry was posted on March 7, 2017 by ladyredspecs in Cooking, Dairy Free, FODMAP diet, Food, Gluten Free, Indian Food, Lactose Free, Light Savoury Dishes, Main Meals, recipes, Side Dishes & Salads, Vegan, Vegetarian and tagged coconut milk, Fodmap, gluten free, Indian Food, spices, sweet corn, sweet corn curry, vegan, vegetarian.